There are a few multi-IM tools out there that let you connect to multiple services such as Trillian, Pidgin, etc. I’ve used a few in the past, but recently, most of my contacts only use Google Talk or Skype, so I rarely use Yahoo Messenger, AIM, or the soon to be shut down Windows Live Messenger. With that being said, these multi-service apps can still be quite nice and sometimes offer the same features with a slimmed down interface over the official clients. 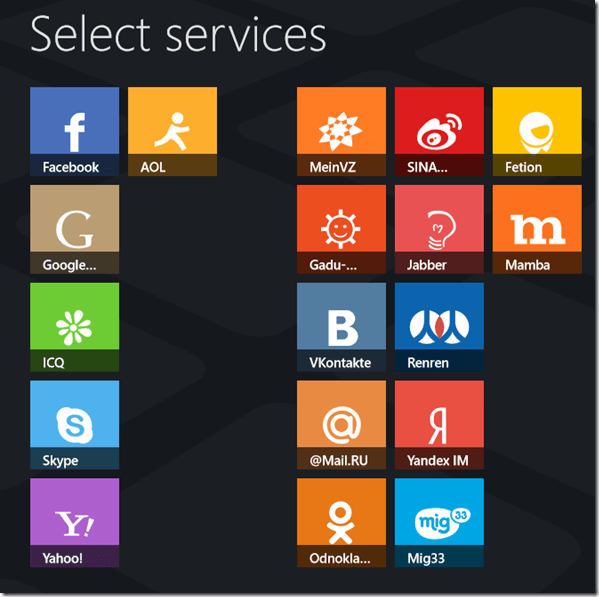 With the launch of Windows 8, most of these apps use the old desktop, which isn’t good if you’re a Windows RT user. Enter IM+ from Shape Services. This app has been available on Windows Phone for a while (with a Windows Phone 8 version coming soon), and is now available on Windows 8 with the modern-UI (Metro). There is a free version and a paid version which is $4.99 in the Microsoft Store. This app lets you connect to all of the major IM networks, as well as many lesser-known ones. When you first start the app, you’ll be asked to select the networks you want to connect to. Then you’ll have to enter your login information for each one. Once you’re done, click on the back button to get into the main screen of the app. Once you get to the Contacts screen, you’ll see all of your contacts, even the offline ones. There doesn’t appear to be a way to only show online/available contacts, which is one downfall. Hopefully this option will be available in a future update. 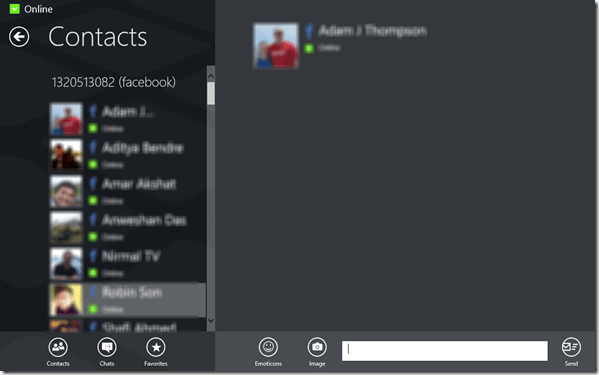 Also note, you can search for contacts using the Windows 8 Search Charm. 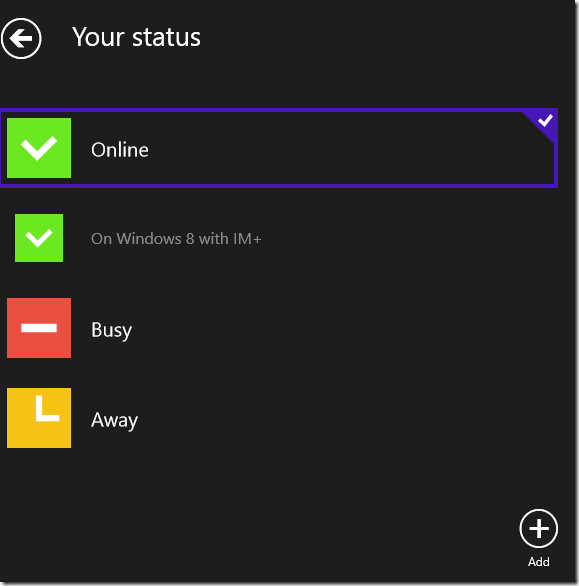 While using the app, you can set your status just like all other IM apps. While typing a conversation, the Enter button on your keyboard is used to start a new line within the message. In order to send your IM, you’ll have to click/tap on the send button. Hopefully an option to change this behavior will come in an update as well. You can also flag some of your contacts as Favorites to have them show up in the Favorites section of your Contact List. The paid version also supports typing notification so you can see when your friend is replying to you. It also adds the ability to share pictures within your conversations. The app settings are pretty straight-forward. You have the option of keeping the app connected in the background, and you can also setup email notifications for when the app isn’t connected. 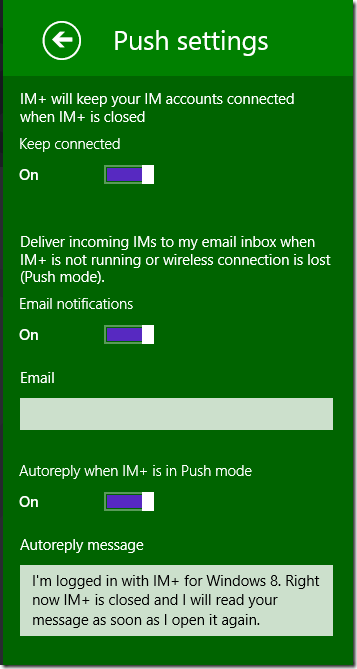 Another neat feature is the ability to setup an auto-responder when it is in push/email mode. Overall, IM+ is a very nice app and it doesn’t feel rushed to the market, even though it is one of the first multi-network Modern-UI apps available for Windows 8/RT. There are a few features that we hope to see in a future update, but Shape Services has pretty good support when it comes to that.